Discover the fundamentals of DMIT – The Dermatoglyphics Multiple Intelligences Test! Concept of the Dermatoglyphics Multiple Intelligences Test! 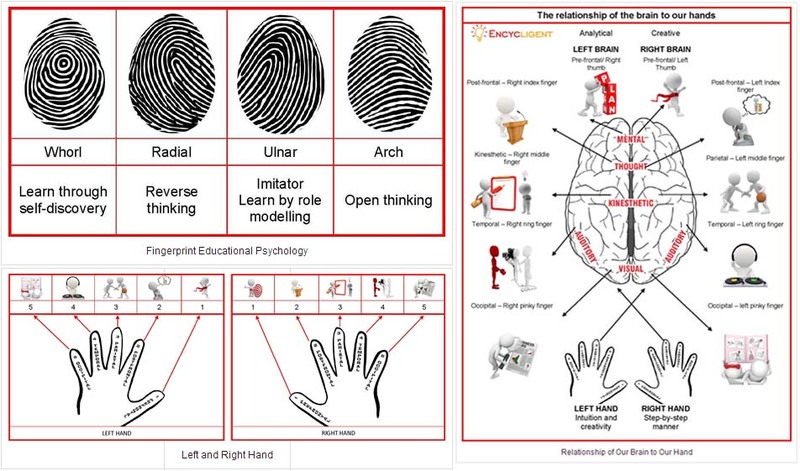 The ‘Dermatoglyphics Multiple Intelligences Test’, also known as DMIT, can be described as an appealing commercial product which suggests that ‘Multiple Intelligences’ can be assessed from dermatoglyphics & fingerprints. During the past years DMIT became a popular niche in some Asian countries with the use of smart marketing techniques focussed on especially young parents, who are often insecure about their child’s future. Is DMIT really the reliable & valide test that it claims to represent? Dermatoglyphics Multiple Intelligences Test (DMIT): a fundamental review! Enjoy the reading, and please do feel free to share your thoughts in response!!! 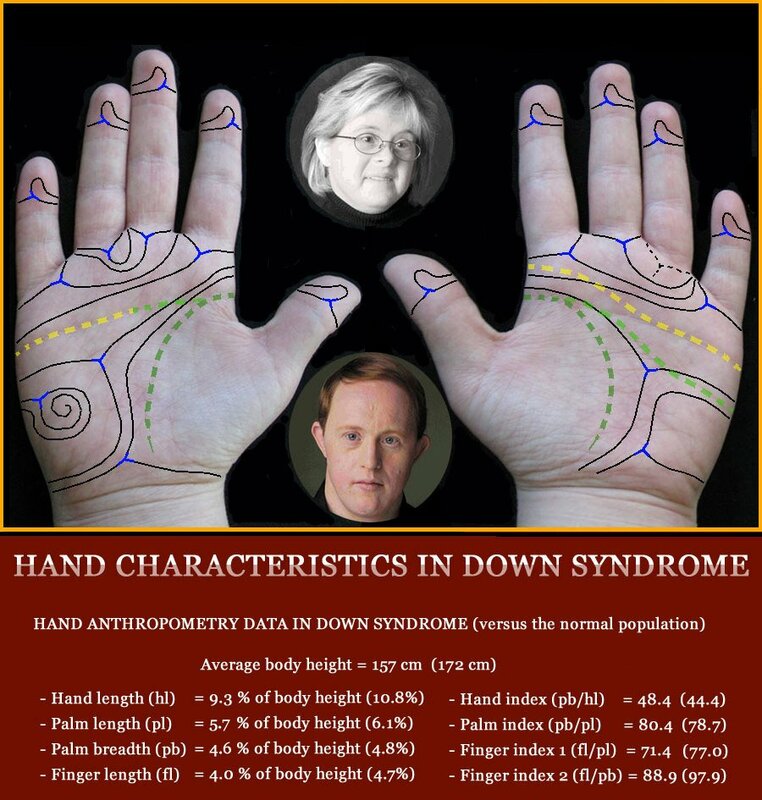 Radial loop fingerprints provide a clue for Down syndrome! Multi-Perspective Palm Reading demonstrates how fingerprint types can become a significant tool in finding diseases and other genetically determined characteristics in an individual. This article demonstrates how radial loop fingerprints can be used for recognizing Down syndrome (trisomy 21). Even though radial loop fingerprints are less commonly see in people who have Down syndrome (radial loops are more commonly seen in the general population), the rather a-typical distribution of radial loops across the fingers of Down syndrome patients provides a very significant clue! This is due to the fact that radial loops usually tend to manifest on the index finger and/or middle finger. 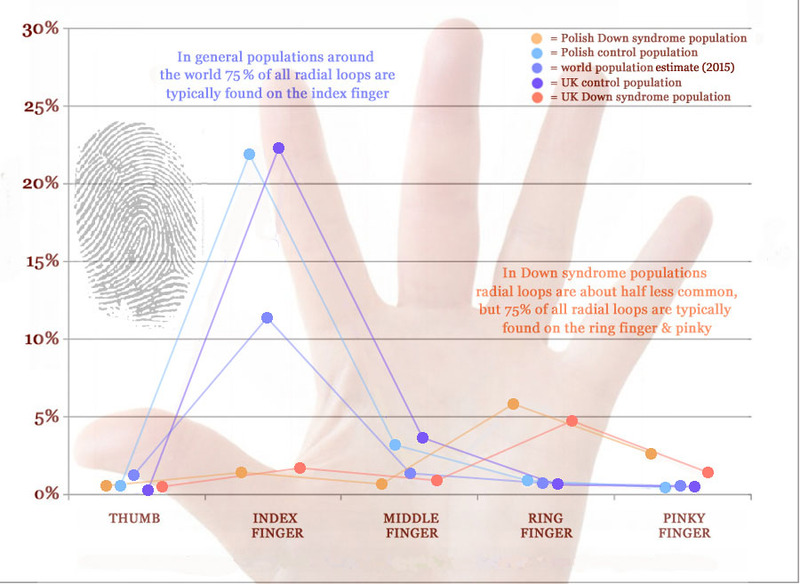 In the gneral population almost 80% of radial loop fingerprints tend to be found on the index finger (2nd finger). However, in Down syndrome radial loops tend to manifest on the ringer finger of pinky (about 75% of radial loops in Down syndrome are spotted on these fingers) – see the picture at the top of this article. NOTICE: Despite these facts one should always be aware that a single radial loop in isolation from the rest of the hand is a meaningless marker. Even in perfectly healthy intelligent people one can sometimes find a radial loop on the ring finger or pinky. This implicates that a consideration of other perspectives of the hand (especially hand shape & finger length morphology) is always required in order to associate a radial loop fingerprint in an individual with Down syndrom! The picture below describes some other typical hand markers in Down syndrome (fingerprints can only provide a clue). Body temperature points out: ulnar side of hand corresponds more with externalized body parts! Palm reading theories have disputed the nature of the thumb. Since the first half of the 20th century a stream in Western palm reading became noticable where the thumb became associated with ‘will)’ and internalized functions, and the pinky became associated with ‘communication’ and externalized functions. This also explains why German palm readers began to describe the radial side of the hand as the ‘Ich-seite’ [I-side], and the ulnar side as the ‘Dich-seite’ [You-side]. Interestingly, there is growing evidence that this German approach was build on solid grounds. 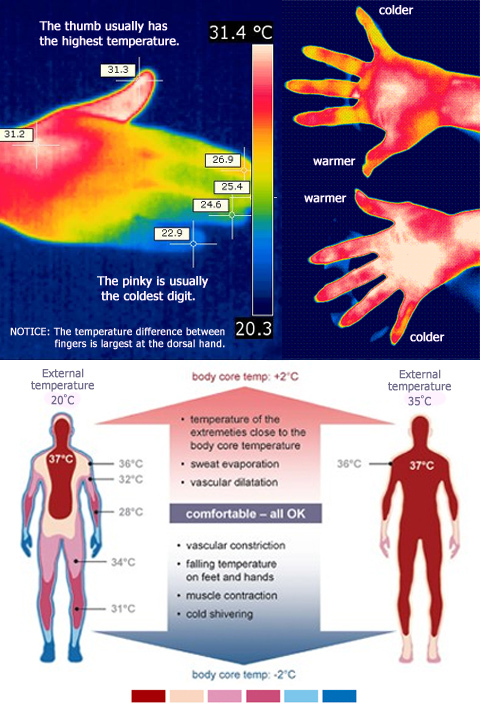 Because body anatomy and body temperature distribution show that the thumb indeed correlates with the central body core, and this approach has also been adopted in Western hand reflexology where the thumb is associated with the spine (which represents the core of the human body), and the pinky and ulnar side of the hand are associated with the more externalized body parts such as the legs, arms, shoulders & ears – the charts at the bottom present the details. During the past few years more direct evidence became available as well. Because two decades of digit ratio studies have pointed out that the results typically point out that high 2D:4D digit ratios (where the ring finger is more dominant) usually get associated with ‘externalizing behavior’, and low 2D:4D digit ratios (where the index finger is more dominant) usually get associated with ‘internalizing behavior’. 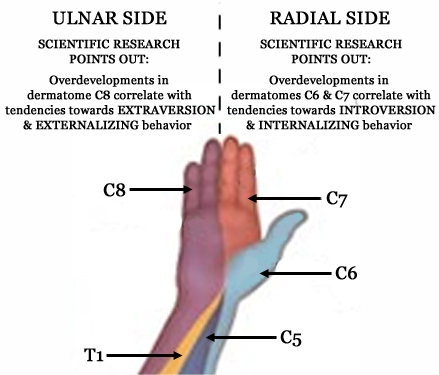 This implicates that various studies have pointed out that the ring finger at the ulnar side of the hand has a stronger connection with extraversion & ‘externalizing behavior’, while the index finger at the radial side of the hand has a stronger connection with introversion & ‘internalizing behavior’. 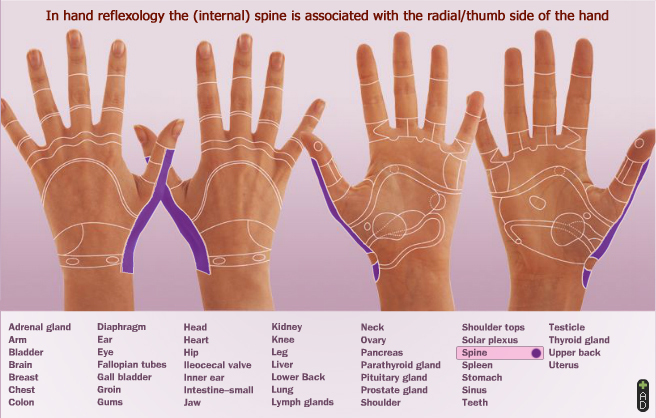 • Hand reflexology: the thumb corresponds with the (internal) spine! 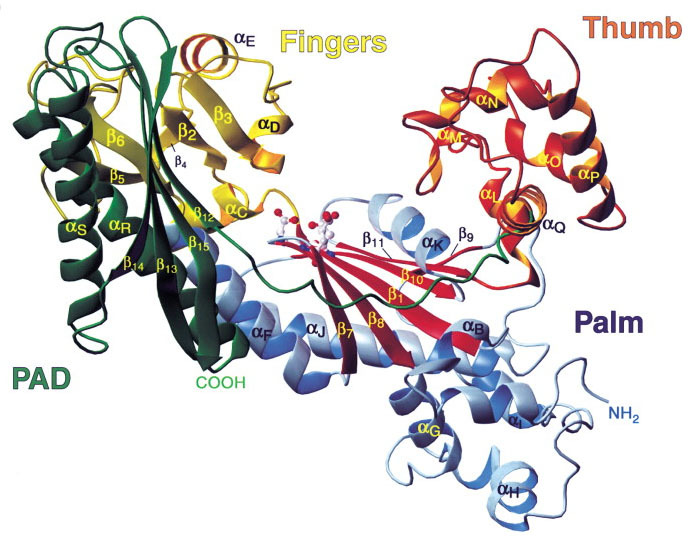 Hand shape gives a clue about Genes, Chromosomes & DNA! Hand shape is often presumed to represent the domain of the palmist; however, the truth is that our hand shape actually represents a clue about our genes, chromosomes and DNA! The plot below describes how human hand shape & finger length proportions typically display genetic & chromosomal characteristics, which play a key-role in the variations between human individuals. IMPORTANT: A precise assessment of hand shape requires a measurement of three aspects of the hand, including: (1) finger length [via the longest digit], (2) palm breadth, and (3) palm length. Human hand shape correlates with genetic & chromosomal characteristics. Primatology palm reading demonstrates how hand structure + function relate to capabilities & behavior. 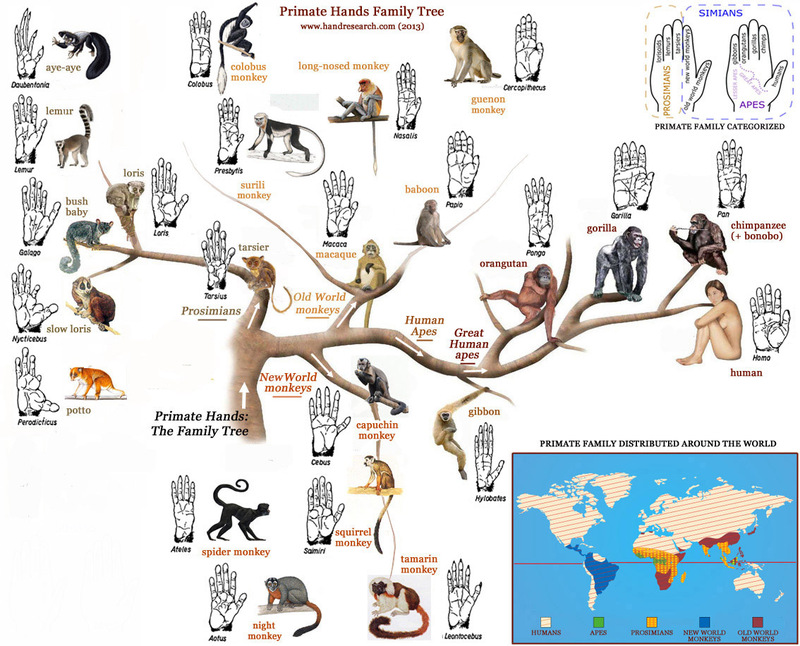 The ‘Primate Hands Family Tree’ (see picture above) describes the typical hand characteristics seen in the major primate subfamilies and the individual species. 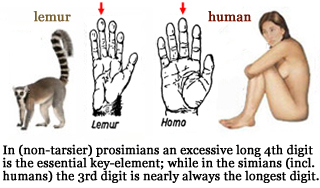 For example, the so-called ‘prosimians’ (lower primates) have a completely different hand structure than seen in the so-called ‘simians’ (higher primates – including human kind). Because in ‘prosimians’ the 4th digit is typically the longest of all 5 digits, while in ‘simians’ the 3rd digit is typically the longest. 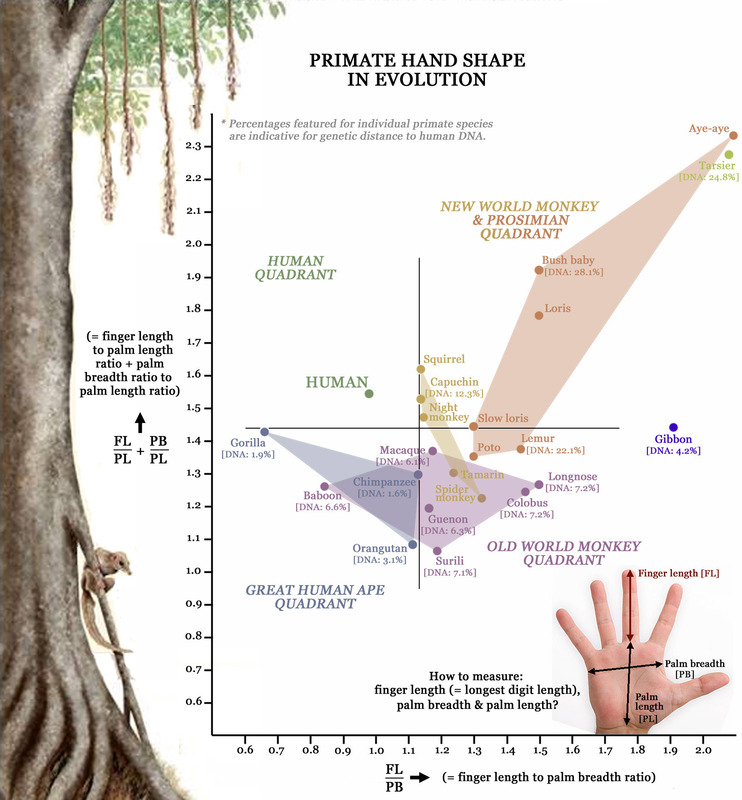 But there is so much more to tell about the hand structure in primates. For example, there is a clear pattern in the male-female hand difference (males tend to have relatively longer fingers + wider palms than females), and the typical hand features seen in gorillas & baboons – who are both known as the most violent primate species! 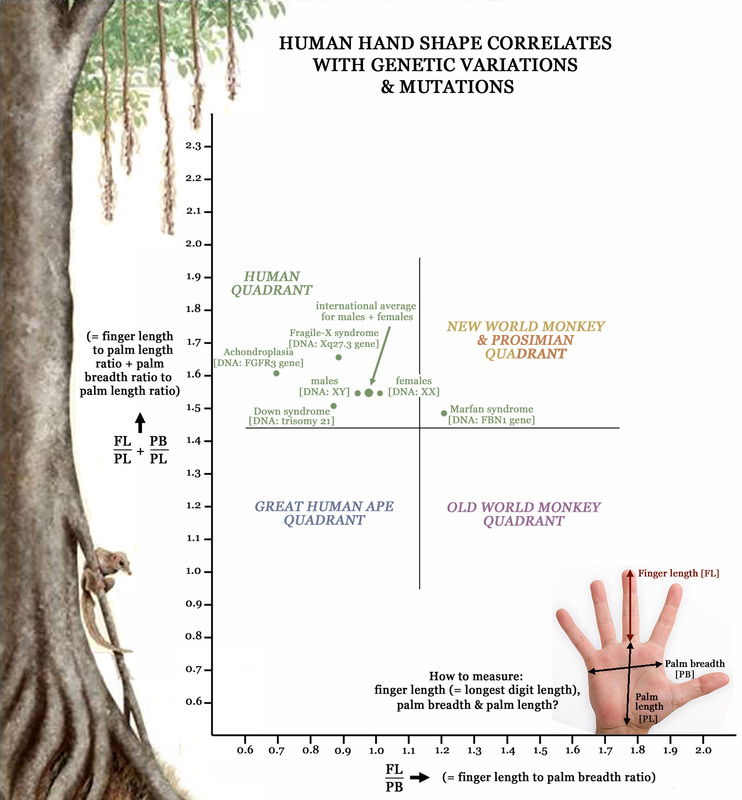 And interestingly… the Primate Hands Family Tree also gives us a better understanding of the nature of the 2D:4D digit ratio (far most primates species have a much lower ratio than seen in human kind) and the fascinating dermatoglyphic ‘whorl’ patterns (in nearly all primate species ‘whorls’ are more common than in us humans). The article ‘Primate Palm Reading‘ includes a summary of many interesting facts about the evolutionary basis of modern palm reading – including 20+ fascinating illustrations! 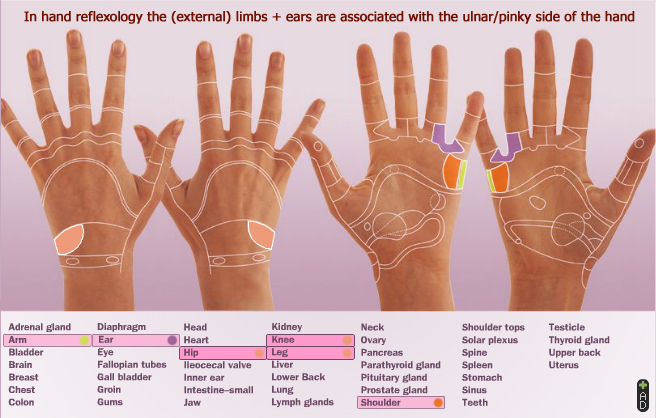 Hand Assessment Chart: A palm reading profile via 36 hand features! Aristole described: ‘the hand is the organ of the organs’. Later, in medical science the hand became recognized to represent the most differentiated external part of the body. This implicates that an assessment of the hand is a rather complex (arbitrary) task. In order to simplify the task an ‘assessment chart’ was developed based on the principles described by Multi-Perspective Palm Reading. The ‘assessment chart’ (see above) presents an overview of 36 key-features of the hand, the significance of all individual hand markers involved has been confirmed in scientific studies – though the significance of course varies and depends on the theme for which a hand feature is used to make a (hand) assessment. The chart is divided in 8 sections, one for each of the 7 hand dimensions (including: dermatoglyphics, finger length, lines, motorics, nails, shape & skin) – NOTICE: the dimension ‘dermatoglyphics’ is divided in a sub-section describing the fingerprints + a sub-section describing palmar dermatoglyphics. Learn more about the background, purpose & principles of Multi-Perspective Palm Reading! 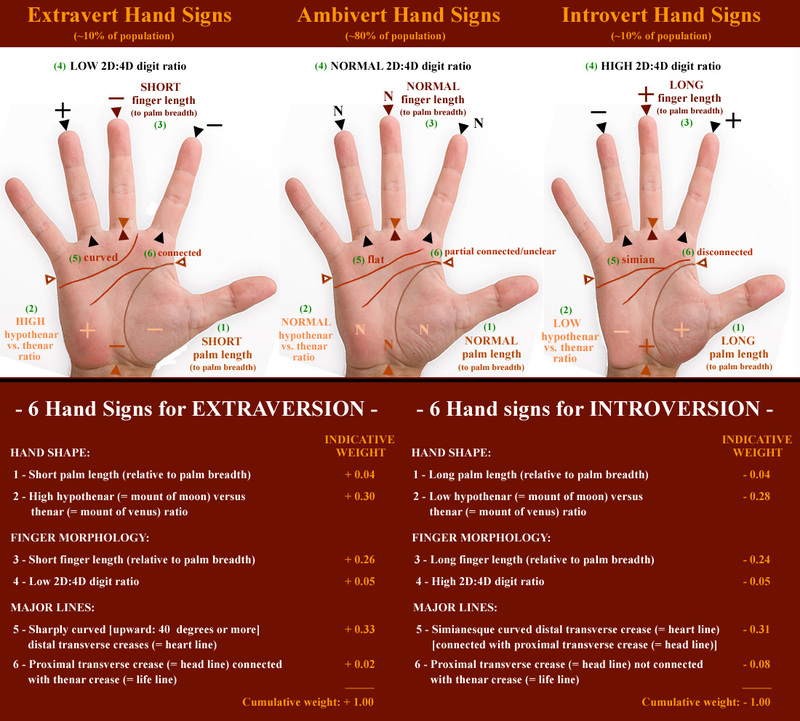 A ‘Hand Model’ for recognizing Extraverts & Introverts! Hand model for recognizing Extraversion (extraverts) & Introversion (introverts). The large majority of people (80%) can best be described displaying a mixture of ‘extravert’ and ‘introvert’ behaviors. However, about 10% of people tend to show consistent ‘extravert’ behavior (and a likewise percentage show ‘introvert’ behavior). Can the tendency towards extraversion and introversion be recognized from the hands of an individual? A Dutch study (some results have already been reported in earlier posts) suggests the answer is: yes!